Thankfully I got my leather fixes at the boot sales and charity shops in the last couple of months, with a new vintage leather jacket, brown leather cropped trousers and 2 black leather skirts-one full circle style and one pencil above the knee. 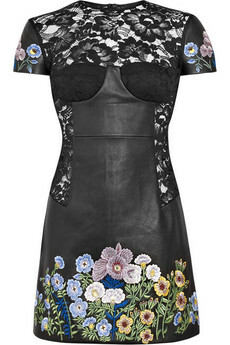 Just love the Christopher Kane dress, mixing lace, embroidery and leather into one look for this season. The Theory dress is very inspirational too and can easily be adapted on a lower budget with a nice black wool jumper and leather mini skirt to recreate virtually the same look. Will you be in leather this season? Love the Christopher Kane one, hate the price! The embroidery looks gorgeous against that black leather background. The christopher Kane dress is a beauty! *sigh* How gorgeous is that Christopher Kane dress!? I haven't found a decent leather jacket for years, I think I may need to check out my local charity shops to see what's on offer! Personally? 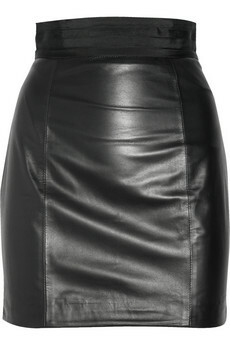 Probably not unless I find myself with the perfect leather jacket...but the CKane dress is just amazing. Are we going to see you in your version of this look tomorrow? Sadly the only leather I will be wearing will be on my feet! I love that Theory dress! Very chic but versatile. I'm not sure I could pull of that Christopher Kane dress, though it's lovely too. I'm thinking about a leather dress, but haven't found the perfect one yet, though I do have plenty of leather jackets. Oh I hope so! I have yet to buy anything real leather (just leather-looking leggings), but I love all your choices, Sharon! I *love* leather! Already have a few leather jackets, and I'm looking out for a leather skirt. I want one with an A-line shape, so that's been very hard to find. 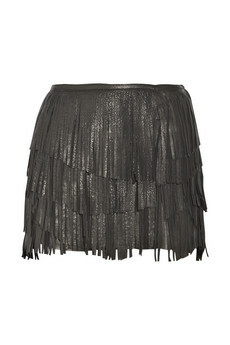 I love the fringed skirt. I'm dying for some leather shorts.